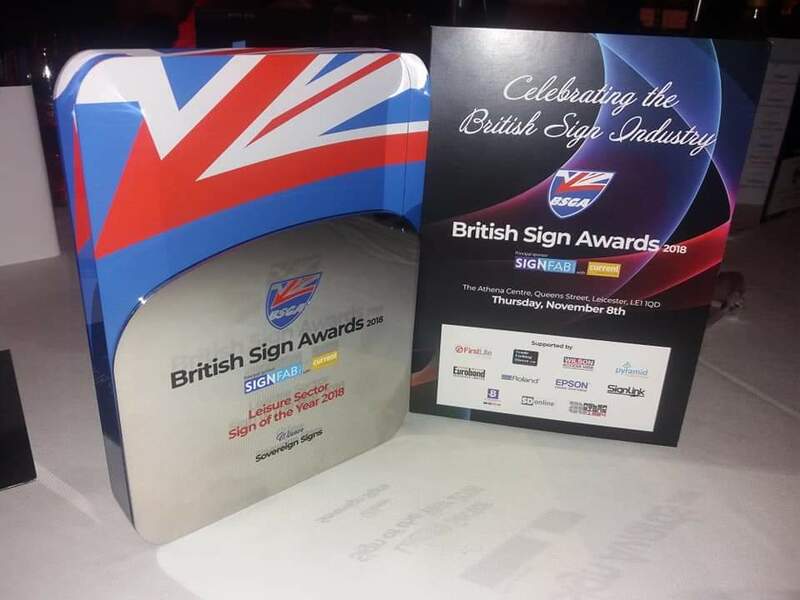 The BSGA's British Sign Awards event took place last night in Leicester where signage providers from all over the country gathered to acknowledge the design, beauty, and hard work of all British Sign Industry. Sovereign Signs were invited to the event after being shortlisted for a number of awards. These awards included; Retail Sector Sign of the Year and Leisure Sector Sign of the Year. Managing Director Iain McKenzie, Sue Cammish, Oliver Hookem and Gareth Naylor of Sovereign Signs attended the event and walked away with the Leisure Sector Sign of the Year 2018 award for the work carried out at the Leicester City Foxes Fanstore. The company's hard work also came close to bringing home more awards - landing a Highly Commended spot for Retail Sign Sector of the Year 2018 and a Finalist position for Sign of the Year 2018! We'd like to take this opportunity to thank those who nominated us, our fantastic clients, everyone who attended the event, and a huge congratulations to the whole team here at Sovereign Signs. It's an honour to bring home such a prestigious award.